The tablet editions don't include the editor, nor will there be community created content; at least, not right away. 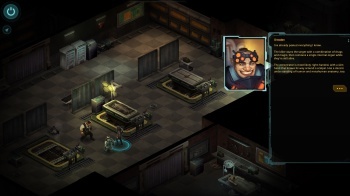 Shadowrun Returns, the fantasy cyberpunk game from Harebrained Schemes that enjoyed a phenomenally successful Kickstarter last year, is taking to mobile devices. Android and Apple versions are now available, at $9.99 a pop. Just don't expect the level editor, or community created content; though there may be a chance of community created content later, as Harebrained hopes to bundle the best community content and release it on tablets "at some point in the future." The Hairbrained team has been overjoyed both to make the game, and by the reception it's received. "It's been a labor of love and represents one of the greatest collaborations of my career," said Jordan Weisman when the Steam version released. "Thanks again for the opportunity." If you're an Apple fan, have a look over here. If Android's more your thing, this will suit you.